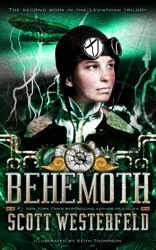 Behemoth is the second in the Leviathan series by Scott Westerfeld. Though I liked the first book, Leviathan, I found it somewhat "mechanical," seeming "to be manufactured of parts that would be recognizable to someone who had done much reading." The second book seems like...hmmm...not exactly manufactured filler, but manufactured complications. The complications book in a series. It also seemed odd to me that the book is called Behemoth when the behemoth is quite a minor part of the book. I don't think it's mentioned until around the halfway point, though I can't swear to that. But, you know, other readers are loving this series. Check out the fan art. Plot Project: Protagonist Alek wants to be archduke and end a war. Protagonist Deryn wants to serve on an airship, even though she's a girl, and now she wants Alek, too. Behemoth seems to be all about keeping them from getting what they want. So this series does seem to follow the give-characters- something-to-want-and-then-keep-them-from-getting-it plot generation plan. I guess you didn't much care for these books. I have the first one but have put off reading it for about two months now. Most people seem to really like it, so it was refreshing to read a review of someone who didn't. It might help balance out my expectations when I finally read it. Oh, yes. I've often had books ruined for me because my expectations were way too high. Hey, Alex, I just realized who you are. I've been following your blog recently. You'll probably never see this comment, but other people--go check out Alex's blog. It's built around an interesting subject.